In 1959 His Holiness the Dalai Lama and some 80,000 Tibetans crossed the Himalayas to seek refuge in India, Nepal and Bhutan. His Holiness relocated the Tibetan Government in Dharamsala, where it is now named the Central Tibetan Administration (CTA) of His Holiness the Dalai Lama. The Central Tibetan Administration promotes a holistic approach to education, emphasizing modern scientific and social scientific learning, as well as traditional Tibetan schooling. The CTA’s Department of Health (DoH) has integrated traditional Tibetan medicine with conventional primary health care. The two systems of medicine run in tandem with each other and efficient cross-referral systems are in place. The DoH runs 44 health clinics, nine primary health care centers, one mobile clinic and seven hospitals in the Tibetan communities in India and Nepal. The Department meets the cost of emergency health care needs and treatment for poor Tibetans. TRAS has supported the education and training of 13 nurses. The 4-year study program and mandatory 2-year internship includes training on curative and preventative medicine, as well as on health education. After completion of the courses, these nurses will be offered employment by the DoH. This project encourages young women to come forward, as it seeks to make young Tibetan women self-sufficient and empowered members of the community. While some graduates pursue their nursing profession in the Tibetan community in exile in Dharamsala, others assist populations in remote areas where there is always shortage of qualified nurses and medical facilities. Many of the nurses who graduate from this program remain dedicated to serving the Tibetan community. For example, one of our students, Tsering Youdon, graduated in 2004 and is now serving at the Tibetan Settlement Gurupura. 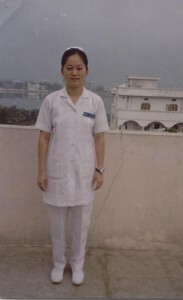 Tenzin Kunsang completed nurses training in 2002 and is now serving in the Tibetan Settlement Orissa. 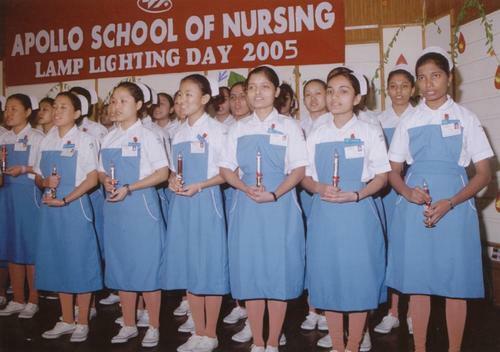 Group photo from the Apollo School of Nursing in New Delhi.